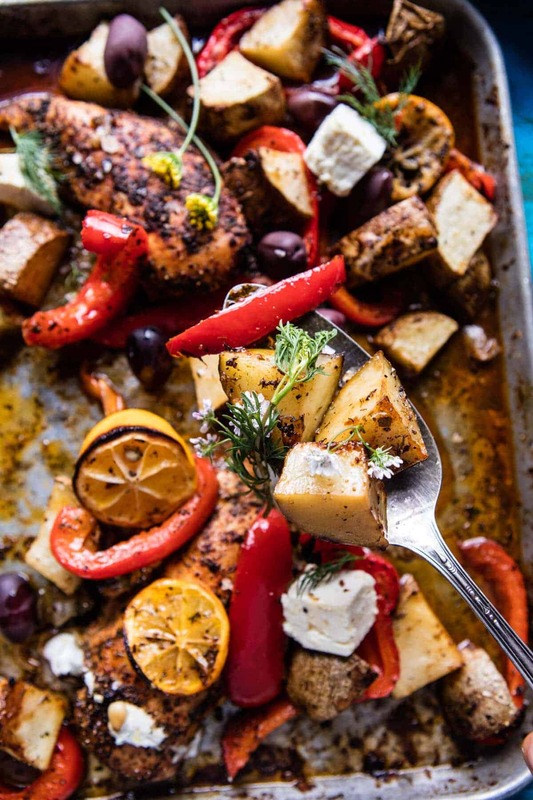 Best Easy Greek Sheet Pan Chicken Souvlaki and PotatoesWEB from Half Baked Harvest on Vimeo. Hey, hi everyone! 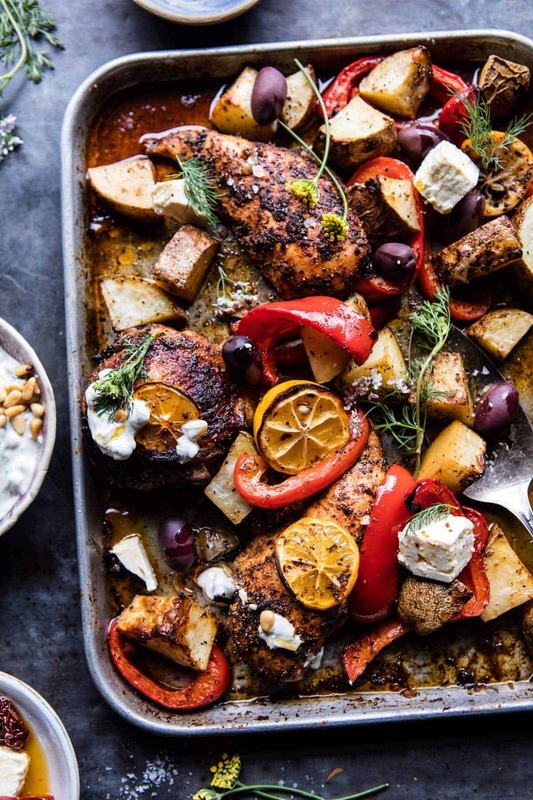 I am so excited for this week, and to be sharing this beyond perfect and super easy Greek sheet pan Chicken Souvlaki with potatoes! <–yes, all made on ONE pan and done in under and hour. And it’s a healthy, well-balanced meal too. Winner. 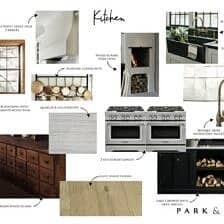 Before I dive into all the details of this recipe, I wanted to take a second and thank everyone for your incredibly kind and thoughtful response to my cookbook cover reveal post last Monday. Originally, I had always planned to respond to each and every one of your kind comments…but then you guys amazed me with your support, and flooded the page with comments. Ahhh! I am still in awe and am just so humbled by everyone’s kindness. As much as I would love to personally respond I had close to one thousand comments. Responding to every single one might take me days. SO I just want to say to everyone, THANK YOU! I spent the better part of Saturday and a good chunk of Sunday, reading through each and every comment. Some of you guys almost brought me to tears, and I know for a fact that a lot of you brought my mom to tears…maybe even my dad! Your words were just so kind and everyone’s excitement over the cover, and even more importantly the COOKBOOK, has me just jumping out of my skin with happiness. I really hope it’s everything that everyone wants it to be, and I cannot wait for you to see it in full this September! I will talking about all the details in the coming months including some fun bonus material for pre-orders, giveaways and events! So much fun stuff ahead, so be on the lookout! ps. you guys are the BEST and I really can’t say that enough. OkOK, Greek chicken and potatoes. Let’s talk about this dish! I feel like a broken record saying this, but I love this recipe! It’s easy, simple and so flavorful. Truthfully, I love anything Greek, plus all of the ingredients that go into Greek dishes…red peppers, olives, dill, pita bread, Greek yogurt, FETA. 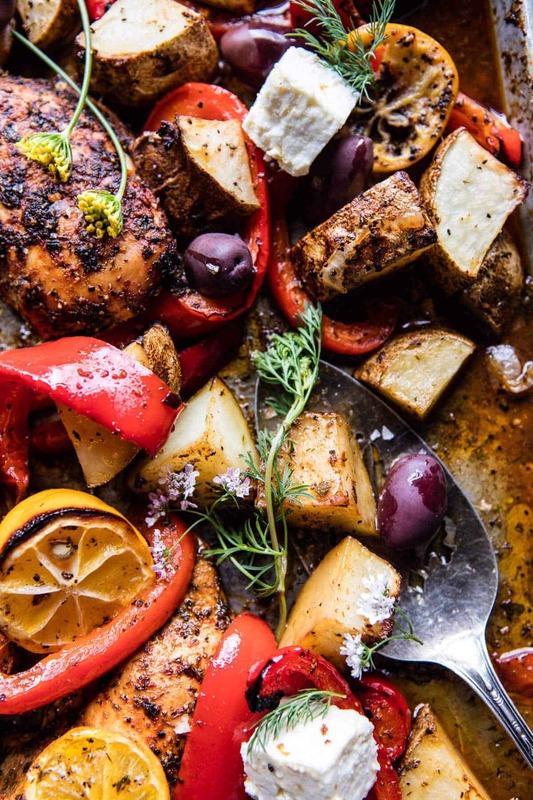 And this chicken recipe basically has all of my favorite Greek ingredients piled onto one sheet pan. 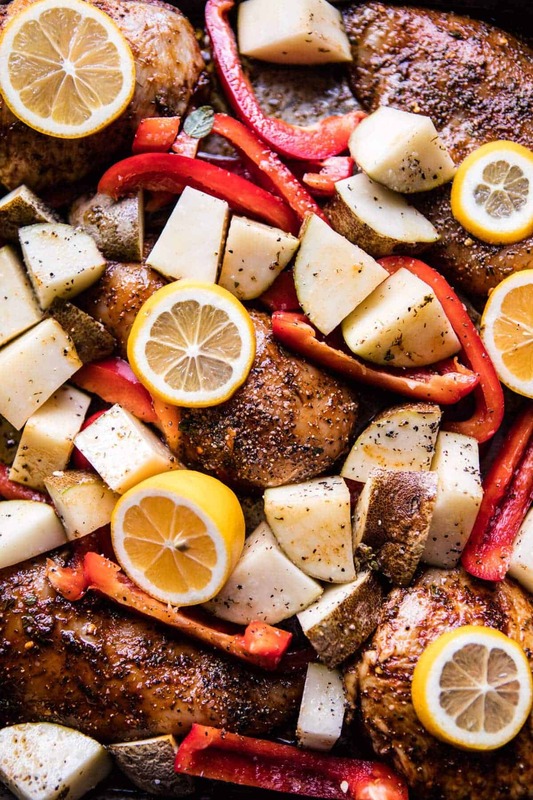 I’m talking chicken seasoned with olive oil, balsamic, dill, oregano, paprika, garlic, roasted potatoes, bell peppers and onions. 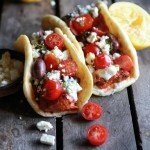 Plus feta tossed with sun-dried tomatoes, kalamata olives AND tzatziki. Yes, you see?? So much goodness!! Honestly, I’d make this ten times over even if it was the hardest recipe in the world to make. It’s really just a bonus (granted a major bonus) that everything gets cooked on only one sheet pan. When I was developing this recipe, I wasn’t even trying to make it a one pan meal. It just made sense to roast the chicken and potatoes together so that the potatoes could cook-up in all the yummy juices from the chicken, making them that much more delicious. I also added some red bell peppers because they’re my favorite, and then some thinly sliced onions too! It’s important to slice the peppers on the thicker side so that they can cook for the same amount of time as the chicken and potatoes. For the onions, it’s the opposite, I like to cut those pretty thinly so they can caramelize while cooking. And then, when everything comes out of the oven, just top it with feta, sun-dried tomatoes and olives. I mean, cuz this is a Greek recipe and all Greek recipes absolutely, no questions asked, need to involve at least some feta. <–that’s my thinking anyway! Oh, and tzatziki too, but if you don’t have any on hand, and or don’t feel like making it (although it’s super easy to make)… plain Greek yogurt works too! The perfect Monday meal, right? Yup. Speaking of Monday, I’m coming into this week with a whole new attitude and positive vibes. Last week was a bit of a struggle and I’m determined to stay positive and have a great week. Insecurity has nothing on me this week! 2. 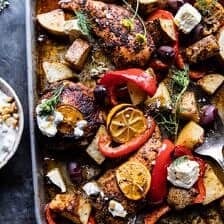 On a rimmed baking sheet, combine the chicken, 2 tablespoons olive oil, the lemon juice, balsamic vinegar, dill, oregano, paprika, garlic and a large pinch of both salt and pepper. Toss well to evenly coat the chicken. Add the potatoes, bell peppers, and onions and toss with the remaining 2 tablespoons olive oil and a pinch of both salt and pepper. Arrange everything in an even layer. Add the lemon slices and then transfer to the oven. Roast for 40-45 minutes, tossing halfway through cooking until the chicken is cooked through and the potatoes golden. 3. Meanwhile, combine the feta, sun-dried tomatoes and their oil, and the olives in a bowl. Toss to combine. 4. To serve, top the chicken with the feta mix and tzatziki. Eat! For real though? That feta is everything. This looks amazing, but it’s not souvlaki. 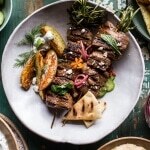 Souvlaki is meat on a skewer. This kind of looks like psito, which is the greek name for roast. So happy you liked it anyway! Thank you Yianna! Give us a break with that Not Souvlaki comment. You wont go to a local Greek restaurant and find it on a skewer. Time has taught us that it does not cook evenly. Still the same ingredients, just no health risk…..Lighten up….lol..lol..
Ok, I’m soooo bookmarking this one, sounds like I should even go and cook it tonight!! Yum, I love souvlaki! Stay strong, think positive thoughts, you can do it! Haha! YES! So happy you have been enjoying them! Thank you for always making my recipes!! This is so brilliant! I literally live and breathe souvlaki, and find this so clever – never would have thought of making a souvlaki in the oven like that! Wow so coo you like it! Thank you so much Corina! The colors in this are gorgeous! looks delicious! do you think it would be possible to use dried herbs in the place of fresh? Aside from using less, would there be any other difficulties? Hi! Yes, dried herbs will work great! I’d use about 1 teaspoon dried. Let me know if you gave questions. Hope you love this recipe! Hey Tieghan! I’ve never commented before but I just wanted to congratulate you on the cookbook. I literally read your blog every morning over breakfast, and seeing whatever new recipe is something I look forward to. 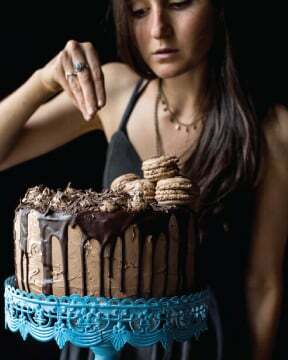 Your recipes are amazing and your photography is gorgeous! 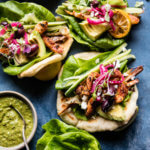 I’m in love with these Greek flavors – this is so happening for dinner tonight! Hope you loved it Laura (: Thanks girl! This looks delicious — I’m just wondering if you used bone in, skin on chicken breasts and thighs, or boneless/skinless? It’s probably obvious, but I’m missing it! Thank you! I use boneless. Let me know if you have questions. Let me know if you have questions. Hope you love this! Oh my goodness this looks delicious and what a great combination of ingredients! Thanks! This looks so delicious! It reminds me a Greek potato recipe that I grew up on. This would be a good addition! Awh so fun (: Happy you like it Lindsay! 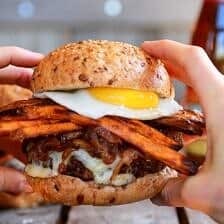 What am I doing scrolling down the food section of Blogloving while I’m at work, this is making me soo hungry! It looks delicious!! Haha, sounds like a bit of self torture! Hope you got to enjoy something delicious when you got home! Looks wonderful! I’m adding ingredients to my grocery list right now. Is the chicken bone in or boneless? Can’t wait to try it! I use boneless! Hope you love this! Made this last night! “Still dreaming about how delicious it was! !” The flavors were incredible. You MUST make the feta cheese, sun-dried tomato and kalamata olive “relish” for this recipe–you’ll be dreaming about this recipe too! Wow!! So happy you liked them so much! I made this last night for dinner and it was fantastic and so easy. Thank you for sharing, this is a really excellent recipe! So happy you like it, thanks Alexa! Welp, I just had dinner and I’m hungry again after seeing this! The feta, potatoes, garlic sounds uh-mazing! My favorite thing about this recipe is that it’s all on ONE pan. Can you say easy peasy for cleanup?! Right!? I LOVE one pan recipes! So happy you liked them Mica, thank you! So happy your going to make these! Hope you love them! Your recipes are always so bright and fresh. I am enjoying making your recipes and reading your blog. Keep up the great work. 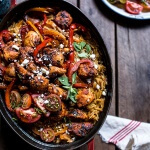 Love the flavors in this sheet pan dinner Tieghan! My husband’s going to love it too. Can’t wait to try! Hope you guys get to enjoy it for dinner soon (: Thanks Mary Ann! Made this today and it was absolutely delicious! The chicken came out a touch dry do you have a recommendation to keep it from drying out next time? So happy you like them Laurie! Thank you! I made this for dinner a few days ago and it was soooo good. I left out the dill (my husband doesn’t like it) and used duck fat instead of olive oil. This is definitely a keeper! SO happy you liked it! Using duck fat was probably delish! Thanks Jamie! LOVED this. Soooo delish and great with a chardonnay and warm naan. Sounds so perfect!! Thank you Annie! SO happy you made it and liked it Monica! Thank you thank you!! Just made this- Yumola!!! Skipped the potatoes for my low carb hubby- added more red peppers- we even ate the roasted lemon pieces. The whole dish is to die for and easy. Going to teach this one to my University son. Thanks again for another killer dish ! Yes!! Sounds soo good! Thanks so much Sue! This looks amazing! My boyfriend and I don’t eat meat though– would fish work? I’d love to make this for dinner tonight if possible. Thanks!! I made this for the first time last night- very tasty!. But, I would make a few adjustments for next time. 1. I used a yellow and orange pepper- for the sake of colour, I would use a red instead of one of those. 2. I would cook the chicken breast for less time- very dry. Or I would try with boneless skinless chicken thighs. 3. Definitely use a sheet of parchment on my rimmed baking sheet! This turned out horribly overcooked. The chicken cooked for way too long while the potatos were barely done. We really enjoyed this, although I had the same problem with the chicken being done long before the potatoes. I pulled the chicken out of the pan and kept it warm while the potatoes cooked longer. Next time I think I’ll parboil the potatoes for a bit before adding them to the pan. I did think there was a bit too much paprika, but that’s my own personal taste. We served it with tzatziki and warm pita, and everyone loved it. Can’t wait to eat the leftovers tonight! I am so glad you still enjoyed this Alison! Thank you! Another winner though my husband didn’t like it as much as the first. My granddaughter is half Bulgarian and spends every other summer there and she said that it tasted like Bulgarian food (close neighbor to Greece) so the flavor is very authentic. I try and use what I have in my fridge/freezer for these meals. Luckily I had everything. I used drumsticks for the chicken though and cooked it about 10 minutes longer because the potatoes were still firm. Chicken was nice and moist. The tzatziki really set off the other flavors. Definitely a winner. Love when you just so happen to have everything you need for a recipe, nothing better than that! 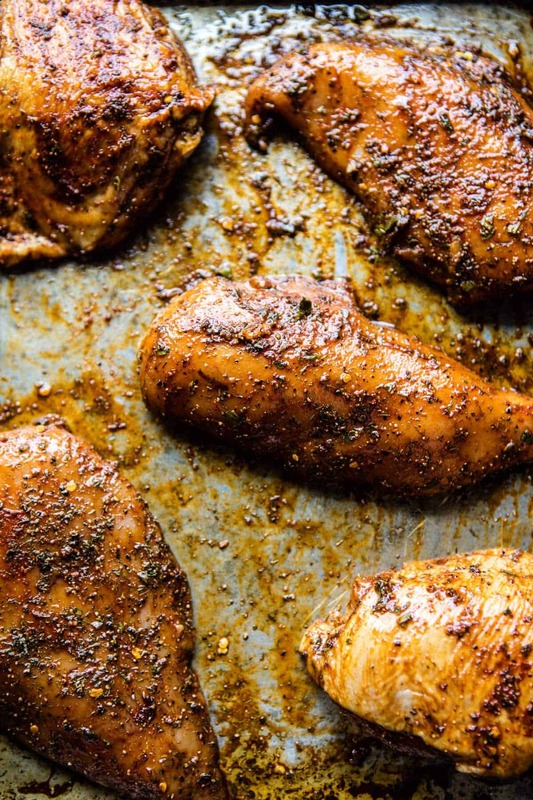 Can I marinate the chicken for some time before mixing on the sheet pan? Yes! You can marinate it for up to 1 day. Hope you love the recipe and let me know if you have other questions. Made this last night along with the Peach Shortcake. Both were a hit! My husband loved this dish and we’ll def make it again. I had lemon balsamic so I used that and it ramped up the lemon flavor. I tossed the feta/sundried tomato mixture right onto the finished dish before serving. Amazing! Loved the shortcake, too, but tried to do it ahead and the honey seized. Redid it later and it was really, really good. I’m so glad I found your blog as I’m loving your recipes! Yay, so happy you both liked it!! Sounds so yummy!! Thank you so much for trying the recipes!! SO happy you liked them both! I was wondering, do you cook the chicken slightly before you bake it, with all the other ingredients? Because the picture shows it that way, but I’m not reading that anywhere. I’m making it for dinner tonight!!! Hi Mary, nope, the chicken is not pre-cooked. Let me know if you have questions. Hope you love this recipe! I made this and it was amazing! Question though- my chicken wasn’t getting as brown as yours. It even seems like yours has a lot of spices on top. Should I try doing a higher temp? 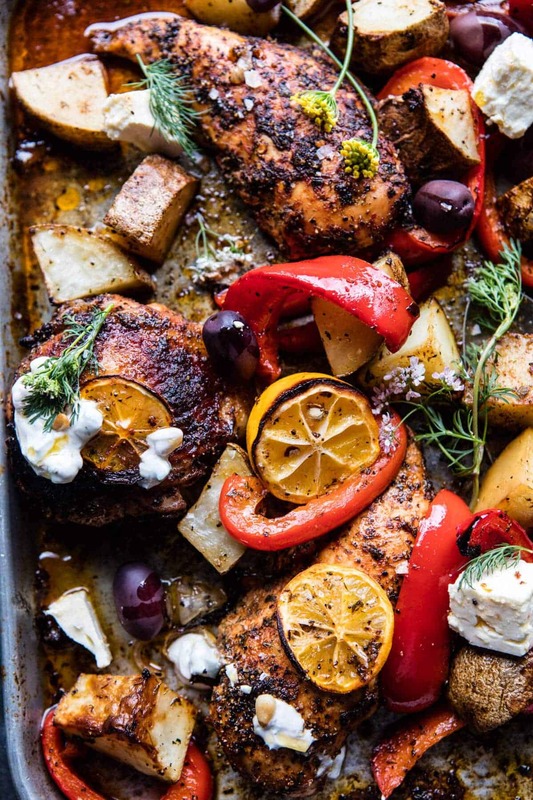 We loved this Sheet Pan Chicken Souvlaki! So easy and flavorful! My husband doesn’t like dill so I left it out. I cut my chicken breasts lengthwise so I cooked the potatoes, onions, and peppers for 20 minutes and then put the chicken on for the last 25 minutes. It was perfect, I would definitely make this again. I love all kinds of Mediterranean food! Thanks for the recipe! I am thrilled this turned out awesome for you Crissy! Thank you! This is so good! I made it twice this week, and it will definitely be going into our regular rotation! Wow that is so great to hear! Thank you Kim! OMG this was AMAZING! I could eat the whole pan myself! So easy too! So so so good! Thank you!! I made this tonight just as written, and it was great. We really enjoyed it. Wish I had made a double batch! Hi I am really glad you like this, and hope it turns out amazing for you! Thanks! Made this tonight and it was a huge hit. My foodie, grown son loved it and there were no leftovers. The house smelled amazing. I am so glad you enjoyed this recipe Pat! Thank you! Your sheet pan recipes ROCK!!! I tried the Cuban citrus one the other week & now this last night. Was amazing! Will make again, Thank you. 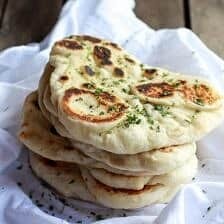 I served with a Pita bread cut in half and toasted. All kids loved! P.s. Maybe a Korean inspired sheet pan recipe in the near future? Best of luck to your brother! Go Team U.S.A.!!! Thank you so much Karen! I am so glad everyone loved this dish! A one pan Korean dish is such a great idea! 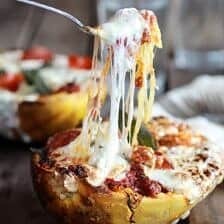 I’ve made this a couple times and it is so delicious and easy!! 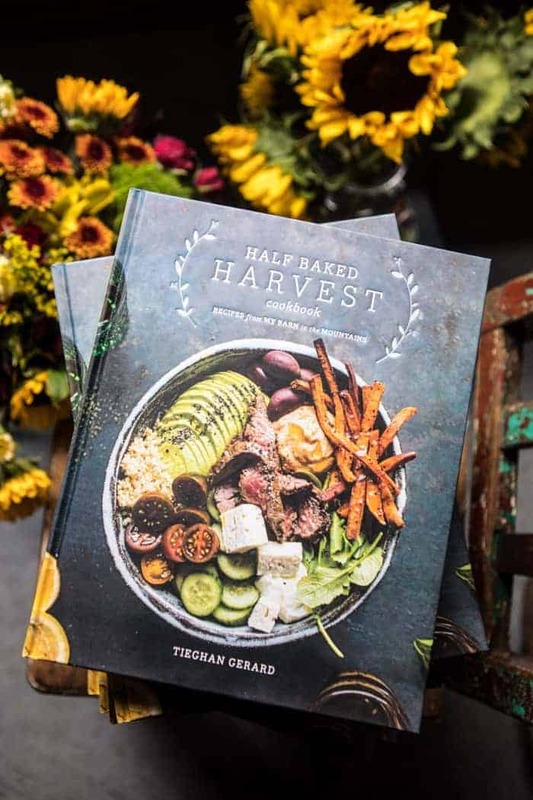 I adore your website, recipes, blog, gorgeous pictures…you have you have it all Tieghan, but please help me. I cannot seem to get my “prep time” down to even near 15 min. Do you have all the ingredients pre-cut/measured? Just made this and it turned out really well! Was a bit worried about how much liquid was present halfway through, but it really cooked off. Will definitely make again. Wish I had made more since there aren’t any leftovers. I really love it when recipes turn out based on the directions with almost no variation. Sometimes, with both online recipes and cookbooks, you follow the steps and it seems like something is missing. Will try more of your recipes for sure! Thank you John! I am so glad this turned out amazing for you and I hope you enjoy some other recipes on my blog! Your recipes look so inviting…66 year old male here, getting ready to cook more…simple menus that are fresh and healthy…and trust me, I need healthy. I will keep you posted on how it comes out…thanks for your inspiration…!!! That is so awesome that you are cooking more! I hope you love this recipe, Henry! Can I substitute for chicken legs with skin on and same cook time? I am so glad you liked this Kim! Thank you!! Also, I can totally picture that and this sounds amazing for one of those days! Made this for dinner. I grilled everything since it is too hot now in CO to use the oven. Was very good, thank you! Sounds so amazing! I am so glad you liked this! i made this last night and it was delicious…super easy and full of flavor! i don’t tend to follow recipes, but recently i have been making yours and they have proven to be consistently amazing! thank you! That is so sweet! Thank you so much Lara, I am so glad you loved this recipe! After reading other reviews, I decided to cube the chicken while the veggies cooked and toss it with the marinade, to have it cook for less time (following the guidance of the Meal Prep Chicken Shawarma recipe, which is an absolute gem) . I added the chicken in at the 20 minute mark. The result was very moist and delicious, but the potatoes took far longer than 40 minutes, potentially because of my very very juicy lemon slices? Who knows, but it was a little difficult since the other veggies and the chicken were done, but the potatoes needed more time. I couldn’t fit everything onto one sheet pan, which may also have contributed to the longer cooking time. Regardless, the meal was very tasty and well worth experimenting with again 🙂 Thank you, Tieghan! Hi Allie! I am so glad you still enjoyed this recipe, thank you! Good recipe. Lots of layers of flavor. I took leftovers into school. I got yelled at by fellow teachers because it smelled so good. No, I did not share! That is so amazing! I am so glad you loved this Dave! Thank you!